I spent ages chasing a problem like this, it was burning a little oil which was blacking the plugs. I had to change the valve guides. Just overhauled the head....new guides and seals, thanks for the attention. 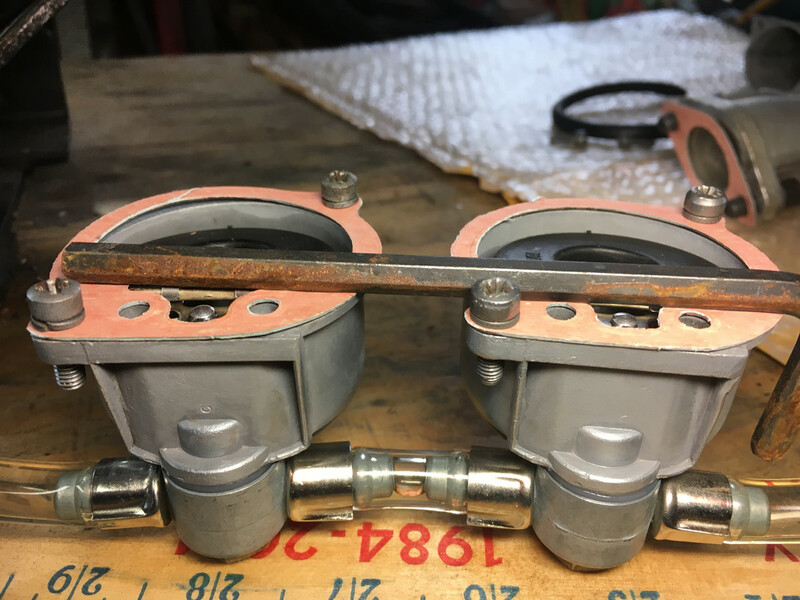 Does your carburetor have the stepped spray tubes that the 850's originally came with? If so, the needles that you replaced need to be the type that have the 4 inscribed identifying circles at the top of each needle. If your replacement needles only have 2 inscribed identifying circles on the top,that would explain an overly rich mixture no matter what position you place the needles. My floats and needles are new, but not “stay ups”, do you find these more reliable? Inlet needles are aluminum black tipped. New as well, came with the rebuild kit. The chokes are gone and it does not idle well until some heat comes into play whereupon it smooths out nicely....but, it does tend to labor or stumble somewhat below 1,000 rpm, in other words it’s not smooth below 1K. Might this tendency indicate too much fuel-not enough fair? I am running BPR -7ES which I have been cleaning when fouling starts. I have a fresh set of NGK B7ES which I was going to install once I confirm my float bowls are accurate. I need to get that horn to you anyway, trade you for the N4G’s? Float bowl level is continually noted since I started this thread and I must admit I simply did not give it the attention it obviously requires, maybe the rich condition is that simple? also, and they only seated well when new. Too high. bumps the bottom of the carb and won't quite shut the fuel off. Just right. with the gaskets on, the floats are barely visible looking at the bowls from the side. My only concern would be that once you get the float level down a bit, you may miss those choke slides. Both of mine need choke to start and warm up a bit, the Titanic more than the SS, which has other mods. Thank you for the photos and guidance Dan. Nothing beats a visual reference. Well, some things do I guess. Returning the chokes, if needed, is not a big deal. I’ll PM you and so we can find a time to get together. Start from the beginning. Check your float levels. Fit the richest recommended main jets you have (220 ? ). Get the motor idling with both slides at bottom. If the idle screws adjust the fuel, wind each one in until you get the miss, then back them off slightly. If they adjust the air, do the reverse. You should get smooth idling. From that point on, the rest is slide cutaway (usually number 3 s), needle jet and needles. Fit the clips in the centre groove of the needles. If you lower them both one notch, you should induce a cough as you open the throttles. If you get the cough, raise the needles back to where they were. If you don't get the cough, keep lowering the needles stepwise until the clips are in the top grooves. If you reach that point, you need a thou smaller needle jets, then repeat the lowering needles exercise. You should not need to fool around with the slide cutaway or any slow running jets. However the needles and needle jets are critical. The size of the main jets is irrelevant unless you are using more than 3/4 throttle. So use the biggest recommended mains unless you intend to fang the bike. Then you need to do plug chops to get the mains right. You should not need to fool around with the slide cutaway or any slow running jets. However the needles and needle jets are critical. When doing plug chps to set the mains, it is wise to use the next hottest heat range spark plugs to the ones you normally use. That way you stay safe. If your bike is jetted properly, under normal circumstances, you should probably need the chokes until the motor warms up. acrotrel - that might be the best explanation I've seen about how to dial in your needles and jets. Thanks! I might have to frame it. Thanks for taking the time to offer the technique....it is appreciated. There are those who believe idling eats the cam and followers. If you have no choke you will have to keep the engine speed up so a plus. Chokes arent really needed unless you live in a cold area or use the bike as transport, rather rare these days. 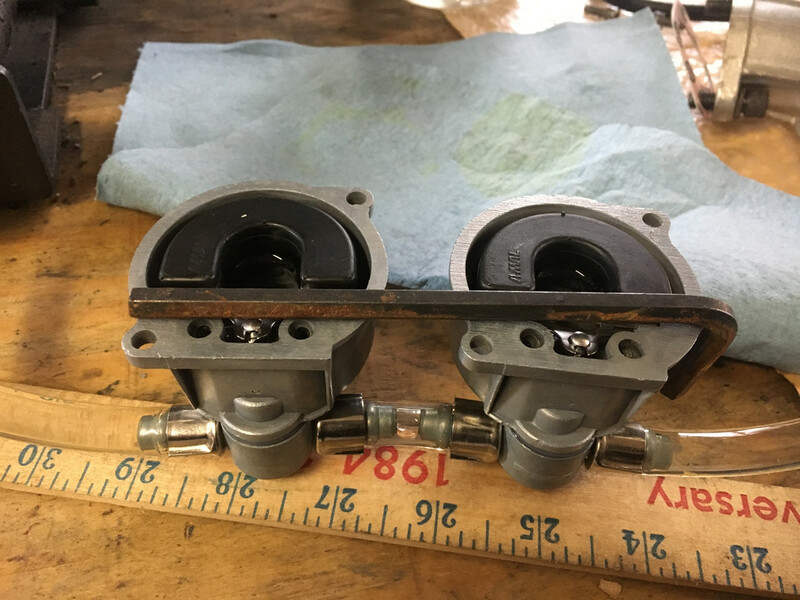 Burlen offers plugs for the carb top if you delete the chokes. I have never had call to use the choke, but then the coldest I've ever cranked in is perhaps 45F. Always used throttle. It is not good practice to rev a cold motor, When I start my 850, I use choke - kick it over and let it idle until it is warm. For me, it is probably worse than it is with you guys, because I use methanol fuel. But even if I was using petrol, I would not rev a cold motor. It is probably possible to crack a piston. That might be worse than wearing the cams and followers ? I'm glad you liked the tuning sequence I posted. If you think about it, it is logical. There are two things - the jets meter and the vacuum varies as the throttle opens. That taper on the needles is about the variation in vacuum as the throttle opens at various revs, so it is a compromise for various types of usage. In some bikes, the ignition systems have advance curves which help adjust for the same circumstances. Normally your fuel octane rating is fixed, as is the comp. ratio - most of us use fixed ignition advance and adjust the carburation as the only variable. However there is probably something to be gained by playing with advance curves and different taper needles. One thing I have not said, is that with my bike I have never bothered to get the main jets right. I know they are probably a bit too rich and that is all that matters. On a race circuit, you are not on full throttle for much of the time, and with the methanol fuel I use, there is a much greater margin for error than you have with petrol. Are you using the new style floats? (stay up floats)? Brass or Aluminum float needle valves? Don't really have to rev but that's another story and away from the OP's problem. I sincerely hope to see him come back with : Got it! 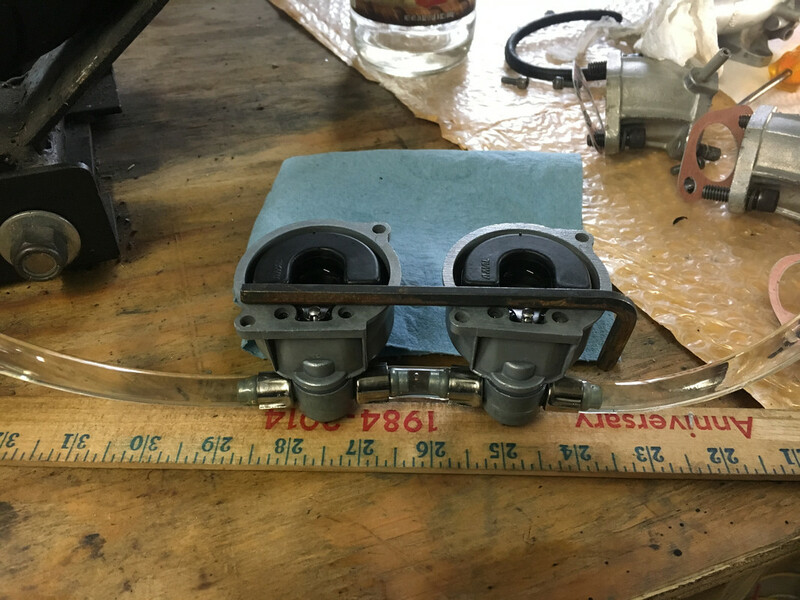 I install and try to get the tube held in a vertical position just as far forward to the front of the carb bowl. I use safety wire to hold it at the tickler. I try to get the top of the fuel level meniscus shape just below the gasket. Both carbs should be even and target for 1.5 turns out or close to that. I use a colourtune system to get my bunsun blue idle. I also never drop my idle below 1100 rpm. I want to feed my cam with oil and I am not trying to Put Put Put like a 6-1 Listor. Alan, is the "cough" what kills the motor as it appears to be idling ok, then sort of spits and dies? If so, I may have to raise the needles on the Titanic. I don't know if either of these would start without choke, but with, both are one or two-kick starters. Crank the chokes up on either one too soon, and they both die. The SS clone, which has a little more compression, seems to warm up quicker.